I might be able to finish this weekend. ❦ Make a matching belt with covered buckle (with a kit from A Fashionable Stitch). And voilà! It will be done. It fits perfectly across the bust, but the shoulders are off somehow. Mine are a bit forward, which I used to compensate for, but never found a decent way to do so for sleeves cut in one with the bodice. I also used to widen shoulders, but didn’t think I needed to do that for the larger pattern size I use now. Maybe I still do. My next project is a loose-fitting blouse, the Sencha from Colette Patterns. 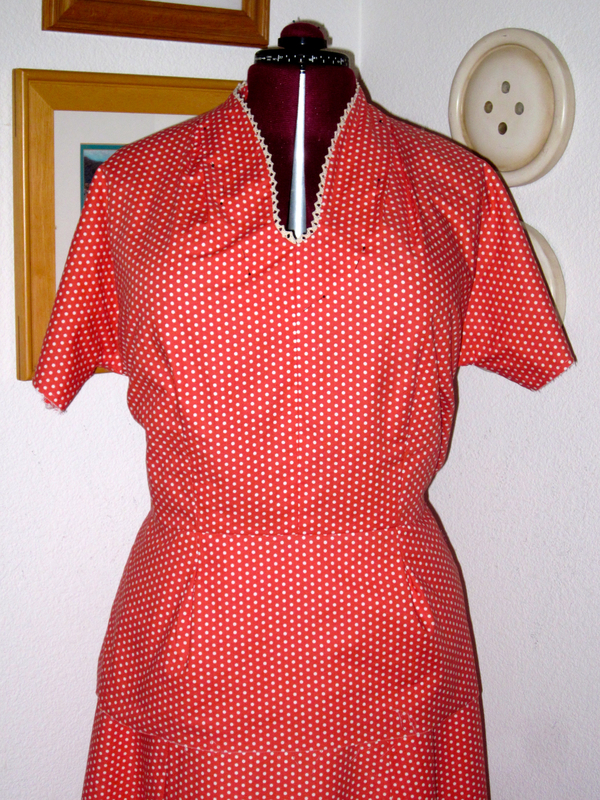 Then I want to perfect a basic wide-leg pants pattern that I can make a zillion times. But after all that, I think I’ll do another sloper (see Glossary). I haven’t done one in years. I’d like to really get a handle on the key pattern alterations I need to make for fitted tops and bodices from the Big 4. I’d like one nice woven white cotton blouse that actually fits correctly and is comfortable to wear! Such a thing is impossible to get in the stores. It might be time to buy some gingham. Looking good. I have a time fitting shoulders as well. Mine are narrow, slightly forward, and the right is 1 1/2 lower than the left. Always a problem, but I do not “over-fit” because it seems to make the disparity more obvious. I had planned to do some blouses this month but quilting and family emergencies have sort of put the kybosh to that, for now. I think your skirt and blouse are absolutely lovely. Thank you, Corinne! I agree that overfitting for asymmetry doesn’t work out. I have a high hip and tried to compensate on a straight skirt with some fitting instructions I found just for the high hip. What a disaster! The adjustment threw that entire side of the waist off grain. On pants, I really should hem one leg a half-inch shorter than the other, but I just can’t bring myself to do it. I hope all sorts itself out with your family situation.